In a cast iron pan or baking sheet (line up the baking sheet with parchment paper or foil for easier clean up) place 1 tablespoon of olive oil. Scatter the garlic slices and lemon slices over the olive oil in a single layer, trying to distribute them as evenly as possible. Take each fish fillet and slather it on all sides, tops and bottoms with pesto (a little over a tablespoon of pesto per fillet—more or less to your taste). Take a little over 1/4 cup of the pistachios and mound it over each fish fillet along the whole length, making sure to cover the entire surface (more or less nuts to your taste). Press the nuts well with your hands so they stick to the fish. Place the fish fillet directly on top of the lemon and garlic slices on the pan. Repeat with the remaining fillets. Drizzle a thin drizzle of olive oil over the pistachios on each fish fillet (about 1/4 teaspoon each). Place the pan on the bottom half rack of the hot oven and bake for 12-16 minutes (depending on how thick your fillets are) until the fish is cooked through and nuts are toasty. Remove from the oven, sprinkle a pinch of salt over each fish fillet, drizzle with more olive oil, lemon juice if desired and serve. Almonds or walnuts can make a great substitute if you’re out of pistachios. 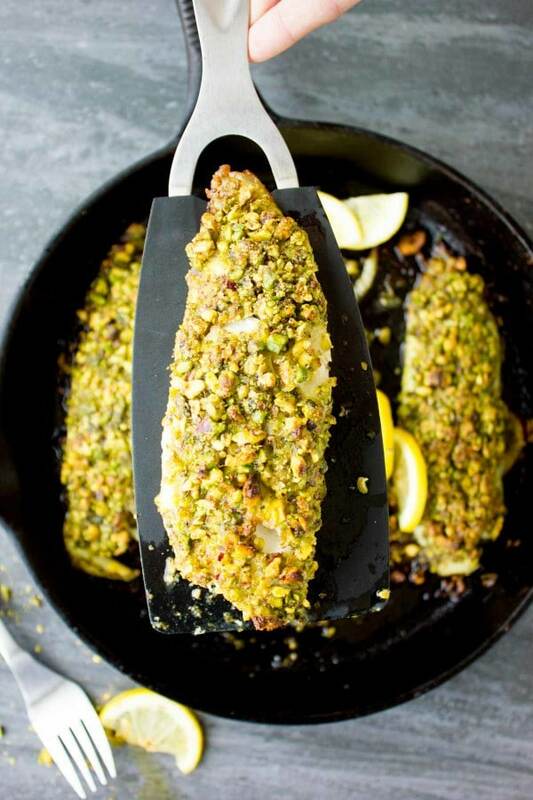 I chose tilapia for this Pesto Pistachio Fish Fillet recipe because it is very neutral in taste and lets the pesto pistachio crust be the star of the show! You can definitely make it with salmon, halibut, haddock and any nice thick piece of fish would work great with the pesto pistachio crust. A thinner type of fish fillet would probably not handle the pistachio crust very well. Looking for an appetizer for this great one-pan fish dinner? Try my Goat Cheese Pistachio Crusted Strawberries!